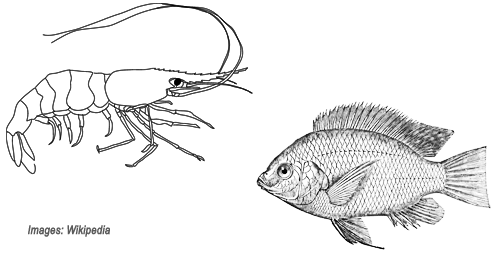 - Combine shrimp and tilapia in the same pond: After 15 days of stocking shrimp, stock tilapia. With each 100,000 shrimp, stock 100 tilapia type 50 grams/fish. If there are too many fish in pond, they can grow too fast and compete with shrimp habitat. After 3 months of farming, shrimp and fish can be harvested. If farmers want larger fish, move tilapia to another pond and continue farming. - Farm tilapia in netted cages in shrimp ponds: this model is the most applicable method; it is easy to harvest. In a 5000-square-meter shrimp pond, cover a 300-square-meter area with nets and stock 5000 tilapias in it. - Raise tilapia in a separate pond, and then transfer water from tilapia pond to shrimp ponds. Add on and farm a small number of tilapia in shrimp ponds. - For intensive shrimp ponds with aerators installed, place tilapia cages or netted areas in low-lying zones in the middle of the ponds. These cages and areas will account for 7-10% of each pond. Nets have sparse meshes (about 0.5 - 1 cm). - Only stock unisexual, lage tilapia (type 15-20 fish/kg). Their size should be larger than meshes of the surrounding net. Stocking density should be at 6-8 tilapia/m2. - In high-density shrimp pond, stock tilapia in cages or netted areas. There is no need of feeding. Ventilate the cages or nets once every 15 days. - Regularly change water in ponds (once every 1 month). Each time, replace 15-20% of water in ponds. Use of bioproducts (once every 10-15 days).